Comments From the Artist: I rarely find time to spend working on my own art these days as I have been rather busy working on this website and other projects, but I thought it was time I shared some of my work with you wonderful folks. This is a drawing I did years ago while working at my old job. There was a lot of down time at my old job and thankfully I had photoshop to keep me sane. This is a portrait of the famous blues artist Muddy Waters. 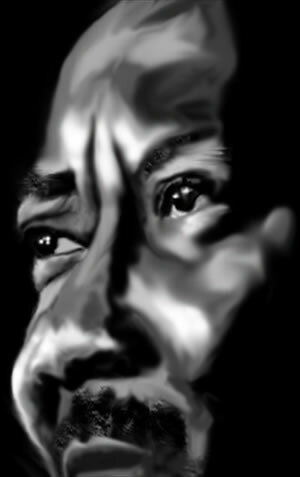 I found a black and white photograph of Muddy Waters and used that as a reference to create this drawing. I had the luck and foresight to see him live many years ago and you have captured his spirit. This is absolutely marvelous and it’s great to see work from the site’s owner. I hope we will get to see more of your work in the future and I also hope you will MAKE time for it to happen…..it has to me made to happen…it won’t happen on it’s own. Thanks for sharing your art work with us. You are truly gifted and thank you for taking time out from your art to do this marvelous website. Your community spirit is very much appreciated. This is beautiful. I love to draw portraits, and I appreciate the detail that gives it emotion. The eyes are great and you can feel the thoughtfulness. Great work! Thanks for sharing with us. Very expressive, Ralph! Wow! You did it! Thanks for ALL you do! Hi Ralph, the light in your subjects eyes caught my attention. This portrait is great….thanks for posting it. Well done with the shading and highlights. I echo everyone else’s comments. When I read your write up and saw the subject as Muddy Waters – I thought how on earth can you make a painting of that – I didn’t realise it was a person. Wonderful ‘soulful’ work – so pleased you shared it with us. Beautiful piece. It captures the essence of the subject, not just a portrait. I think this is wonderful. It shows a lot of expression in that face. It just tells a story! This is excellent! Really expressive closeup. I wish you would give lessons.. I first want to thank you for creating this wonderful interactive, educational website where all artists can share and learn. Believe me, I understand about the time it takes from your own CREATIVITY! KUDOS to you! GREAT emotion was captured in this digital painting and the expression in the eyes is wonderful. Creations in black and white can be powerful, indeed. I would offer only two suggestions. The eye that is farthest from the viewer, the one on the left, comes forward a bit too much, and this is because the corner of the eye creates a white triangle shape that is very distinct against the left dark iris. If the edges in this area would be softened a bit, and the “white” of the eye be toned down a bit, the eye would stay back visually on that side of the face. The perspective normally would indicate this because that eye is farther from the viewer. The other suggestion would be to darken a bit the very light tone on the farthest cheek to the left of the nose. By doing this, the nose shape would be a bit more prominent and it would give more dimension to that side of the face. This would give the illusion of the face turning away as it does in real life. Maybe also emphasize more the eyebrow shape on the right side of the face, as you did on the left side. A thicker brow on the right side would add to that great expressive look you captured in his face! As it is now the left one, being the farthest one away from us, is more important and has more contrast. This is a a very expressive creation! THANK YOU for sharing your work with all of us! At last i have seen your work ,you are really talented . I love painting portraits with all mediums and this portrait is very marvelous and expressive .I hope to see more of your work .Thanks a lot for all your efforts . A very powerful portrait, Ralph…… congrats, and congrats on the wonderful site as well…. thank you. Thanks for sharing this with us. Beautiful. This is wonderful! I like that you varied the hard and soft edges to give it texture. I like the contrast and drama. It feels a bit metallic which is visually interesting. You “bronzed” a great moment here. Thanks for sharing this piece with us and thanks for all your hard work on the site. I feel blessed to have this resource! I would like to send a heartfelt thank you to everyone for taking time to view and comment on my little drawing here. It means a lot to get the opinion and honest feedback of so many gifted artists. Music is another great passion of mine and I really enjoyed doing this tribute to the great Muddy Waters. It is nice to see that there are some blues fans here as well! I also appreciate your expressions of gratitude. This website has been an immense joy for me and I am so thankful for all of you and your contributions to this site. Without you, this site would not exist. Keep up the great work! Viewing all of your wonderful work has given me that “creative itch” to get back into painting again. Oil painting is my first love and I am currently working on a new oil painting and hope to have that completed soon. I will definitely be sharing it with you all. I have learned a great deal about painting and other forms of art from all of you, more than I ever received from any book and for that I am most thankful. Ralph, your a very talented Man. A talent portrayed! This has such expression Ralph. I am so pleased to belong to this site and thank you for your efforts. That is a great Drawing you have done of Muddy waters and you are a very Talented artist I love the blues music I have quite a few of his CDS lokk forward to see more of your art . Thank you for your generous compliment! I appreciate that. Thanks again for stopping by and leaving your comment. Have a very artistic day! I am teaching my self to draw using pastel pencils and colored pencils and paint in watercolor I would like to try oil but not sure if I would like it as it looks hard to do but when you see paintings in oil it looks so good but know doubt I may try it one of these days.